I found myself out on trail today. That is not unusual. I love to hike. What is different about my hiking today is that I usually do day hikes. Not much backpacking in the last couple of years. The last time I backpacked was on the Benton MacKaye trail in Georgia and Tennessee. That was a little over two years ago. I found myself on a local trail thinking about my backpack days. I am a minimalist or ultra light backpacker. That means I try to take as little weight as possible. I shave off ounces. Every 16 ounces makes a pound. A pound does not sound like a lot but it is one pound less that I have to carry on my back. I make much of my own gear to help eliminate wasted pounds. For some reason I had brought my trowel with me. I was not going to need it. I was not going to poop in the woods. If I got the urge I could hike back to the car and use the facilities provided by the State Park. Of course they are not the best but better than pooping outside or in my drawers. My trowel has two purposes. One it digs a hole when it is time to go. There is a whole book called How to Sh*t in the Woods. Before going out on a multiple day hike I would recommend to read this book. The second purpose for my trowel is that it holds my duct tape. All experienced hikes recommend a little duck tape for the trip. A whole role of duct tape is wasted weight. The cardboard middle is enough to set you over your weight limit. You will never have a need of a full role of tape and there is no reason to carry the added weight. This is an old ultra light idea, gastritis I learned from my mentor, doctor wrap your duct tape around something. I know many packers that wrap their tape around a pencil or a lighter. I have never needed a pencil on the trail. I don’t journal, I just enjoy the wilderness. So I wrap my duct tape around my trowel handle. After all I am going to carry my trowel Anyway. I am not leaving home without it. Ever try digging a hole in the wilderness with your hands? 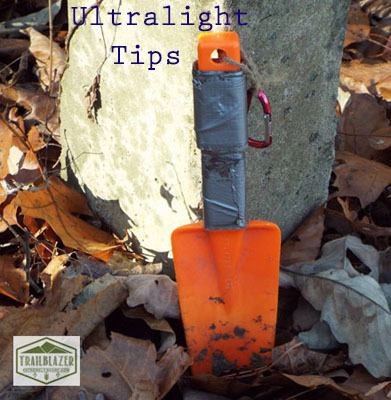 Since my trowel is always with me hanging from my pack, I wrap my tape around the trowel handle. I always have easy access to my duct tape..
That is the scoop so to speak. If you want to bring duct tape use your trowel handle. Save you weight and time. You always know where your tape is and don’t have to rummage through your pack to find it.